I have just returned from a week in the field. 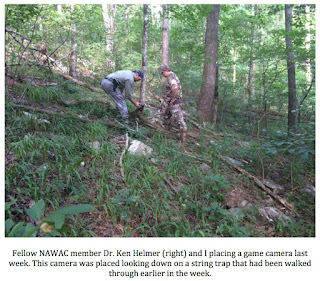 I was participating in the NAWAC’s long-term field study in the Ouachita Mountains. After a rather hectic last year in which I dealt with job changes, health issues and the preparation for my oldest daughter’s wedding, it was a much needed respite from the every day world. While I did not come away with definitive proof that a large, hirsute, bipedal ape inhabits the area, I, and my team, did experience some interesting things. I will share some of these things below. Please understand that I cannot, and will not, share sensitive details regarding the operation. The synopsis below is just an overview of some of what took place and my opinions regarding the events of last week. To start, it was brutally hot during the week. Heat advisories were issued for each of the seven days I was present. The heat seemed to put a bit of a damper on wildlife activity during the bulk of the day. Not much was moving until the sun finally began weakening late in the afternoon/evening. That is not to say, however, that there was no activity during the week, not at all. My team arrived on Saturday the 19th. We spent the remainder of the day setting up camp and getting organized. Once all of that was done, we walked out to inspect several string traps that had been set up in strategic choke points along game trails. 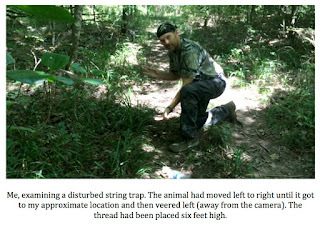 String traps are a means to discern the direction wildlife is traveling and what trails/routes they are using to do so. The idea is simple, black thread is tied to a tree, post or other object at the desired height. The thread is then pulled taut and wrapped, not tied, to another tree or object. The height at which the thread is set depends on the animal you are attempting to get a read upon. Our string traps were set at six feet in height. We feel this height allows deer, black bear and other conventional wildlife to pass underneath the thread without disturbing it (While it is possible a deer could choose just that spot to leap or bound or a bear could choose to rear up on its hind legs, the chances of that are slim). When an animal walks into the thread, the wrapped end slides free and the thread is pulled forward with the animal (the tied end remains in place). The thread will cling to the animal until its length is exhausted. It will then lay on the ground or brush and allow you to discern which direction the animal was traveling when it came through. We found several of the string traps that had been placed last week had been walked through. We reset the thread on these traps and returned to camp. We heard a few odd noises and movement from time to time but nothing we could readily attribute to ape activity. The second day was highlighted by several wood knocks and some possible rock on rock and rock on metal banging. I will be the first to admit to having been skeptical about the wood-knocking phenomenon when I first began seriously looking into the sasquatch mystery years ago. I am skeptical about it no longer. I have never seen an ape actually hit a tree with a branch or piece of wood but these knocks and bangs do take place. 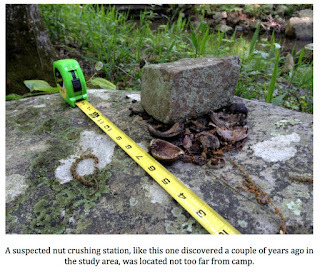 The reality of this phenomenon really struck home several years ago when NAWAC members located a piece of cut firewood at the base of a tree about ¼ mile from the area where we camp while in the study area. The tree had obvious damage from being struck and the piece of firewood showed telltale signs of having taken a beating as well. It seemed pretty clear that this piece of firewood had been used to strike this tree on multiple occasions. Members struck the tree with the firewood and it replicated perfectly the sounds several groups had heard from the area over the previous few weeks. Simply put, this firewood had to have been carried to this spot by someone/something. Once there, someone/something with hands had to pick it up and pound it against the tree. Bears cannot do this. Mountain lions cannot do this. No known wildlife native to the region can do this. This leaves only two possibilities, people or apes. I will not try to convince anyone as to how remote this location actually is, believe me or not. I will say only that the idea that some person would swipe a piece of firewood from our camp, carry it ¼ mile away and use it to periodically beat the crap out of a tree in order to get a group of armed men to race to the location is pretty outlandish. The bulk of day three was spent still-hunting without any luck. I camouflaged up and took up a concealed position in an area we believe these animals travel through on a regular basis. I did not see anything, however, and returned to camp after several hours. I had not seen so much as a squirrel during the hunt. Again, I am sure the heat played into this and the wildlife was hunkered down in shady spots in the area. About 11:00 p.m. that night, shortly after our final team member arrived, a foul odor briefly filled our camp. It was the “sweaty horse smell” we have encountered so many times in the area before that, we believe, indicates an ape is in close proximity. The smell dissipated quickly, however, and no activity ensued. Day four was fairly quiet. Several hours of hunting revealed nothing. We heard what might have been a faint wood knock around midday and something I can only describe as a “tok” sound coming from the woods near our camp. That evening we broadcast some ape and chimp sounds in the hopes of getting a reaction from the locals. One of our team members believed a large animal of some kind approached camp later that night but fled immediately when he rose to try and get a look at it. The next day was spent placing some cameras in strategic spots around the area. 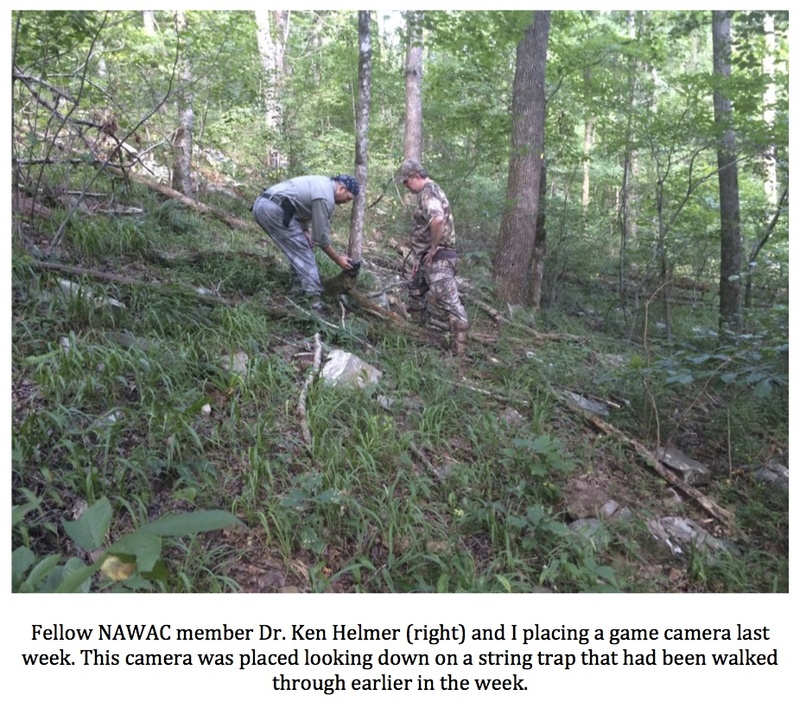 The NAWAC has attempted to gain photographic evidence via game cameras in the past (See Operation Forest Vigil) without any luck; however, cameras have continued to get smaller and less obtrusive over the years. Since these cameras were not going to be in the field for months/years at a time, no bulky protective bear boxes were necessary. The combination of the small size of the cameras and the lack of bear boxes gave us hope that we might get lucky and they would go unnoticed. Several of the cameras were placed overlooking string traps that had been disturbed the week before. About 8:00 p.m. we heard the most interesting wood knock I have ever heard. I will not try to describe the cadence/rhythm here but will say that it was rhythmic, clear and unique. I have never heard anything like it and have no idea what could explain it (other than our quarry). One of the other members present immediately answered the knock using the same cadence but we heard nothing else. That night we played some more primate vocalizations but did not receive any discernible reply. After turning in, our nighttime visitor returned. Again, the animal fled the second we moved in an attempt to get a look at it. Day six was fairly quiet with two notable exceptions. We had started by examining the area where the animal had approached the camp the last two nights. It was clear that something had been in the area as we found trampled vegetation and a faint game trail. No distinct prints, hair or other evidence was located. About 8:30 p.m. we heard what I can only describe as a very big noise. It sounded like a Volkswagen had been dropped off a three-story building. I have no idea what it could have been. Pondering what could be powerful enough to create such a noise sent a shiver up and down my spine. Later, we all heard another loud noise. This sounded much like a large tree falling. It was a loud, prolonged, bang and crash. We were unable to locate any fresh tree falls in the vicinity. The next day was spent scouting out areas where the team following us will be attempting something new. To my knowledge, the experiment is something no bigfoot group has ever attempted before. I am very excited about this experiment and the possibilities it represents. It is not for me to discuss in any more detail than that here, however, as the details of the effort will be revealed by the NAWAC when the time is right. The rest of my time in the study area was fairly peaceful but occasionally interrupted by wood knocks and rock on rock sounds. We also located what might be a nut crushing station similar to one located a couple of years ago in the area. 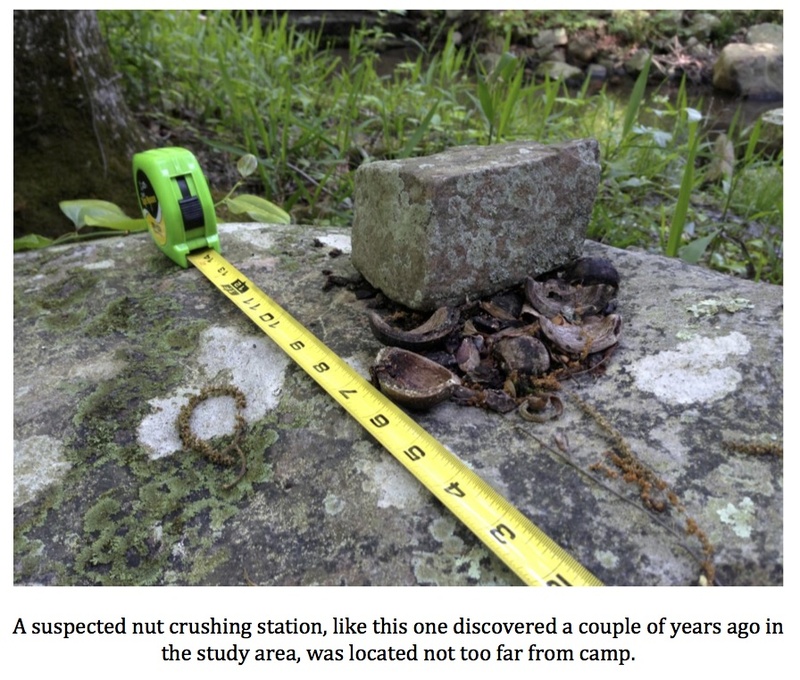 Basically, hickory nut and/or black walnut shells are found smashed on top of a large boulder. Also on the boulder is what we have termed a hammer rock. The remnants of shells and pulp are stuck to the underside of the hammer rock, seemingly, indicating it was used to smash open the nuts. This is a behavior that has been observed in known primate species. What could be indulging in this behavior in North America, particularly our main area of study, is anyone’s guess. That is about it. It was a great week spent in true wilderness, the type of place most people think does not exist anymore, at least in our region. I remain confident that wood apes inhabit this and other areas in the Tex-Ok-Ark-La area. I also remain confident that, eventually, we will get the evidence we seek proving, once and for all, these animals are not myths and are, indeed, flesh and blood creatures in need of our protection. I have been pretty quiet lately and thought you all deserved an explanation. While I have been a bit inactive as far as cryptozoological matters over the last few months, I have been anything but inactive. There are several reasons for this, which I will touch on below. I was diagnosed with skin cancer toward the end of 2014. I had a large knot/tumor in my eyebrow above my left eye. I underwent surgery to have it removed in the spring of this year. The surgery turned out to be more extensive than was originally anticipated and ended up including a skin grafting procedure. The graft failed to fully take and I may yet have some procedures ahead of me to minimize the scarring. The good news is the cancer is gone. The health issue also led to some career changes. I am a teacher and a coach (football/basketball). The doctors strongly recommended I not be in the sun for hours on end starting in July and August like I have for 15 previous seasons. After wrestling with it for several months, I have retired from football coaching. I will continue to coach basketball but getting all these changes lined out took some time and has kept me busy. By far the biggest reason I have been preoccupied has nothing to do with health or job issues; rather, it had everything to do with my oldest daughter’s wedding. She was married just last week. It was truly a joyful occasion for me, and the entire family, but I can tell you the last few months have been very hectic (not to mention expensive, lol). Never would I have imagined the amount of work putting on a wedding actually is, never. It has been quite exhausting. I can only imagine how my poor wife feels. So, all of those things put together, plus the historic amount of rain Texas received earlier this spring, which forced me to limit my activities, have kept me away from all things cryptid. I will be getting back in the swing of things, though. I will be leaving tomorrow morning for a week in the Ouachita Mountains where I will be attempting to find evidence supporting the existence of everyone’s favorite bipedal ape. I’ll be providing an update on how the week went upon my return.